Well, we are two weeks into Miss Thang being on Prozac. So far, the reintroduction process is going well, but I can tell that both Chaz and Miss Thang still don't trust each other completely. I think the Prozac is working, but it can take 3-4 weeks for it to be completely effective. I have a stand-by prescription for Elavil for Chaz in case he needs it. Prozac helps for aggression and the Elavil will help with anxiety. Sometimes in these cases, you have to treat both sides of the equation/problem. Like I mentioned before, Miss Thang is the alpha/aggressor and Chaz is submissive/fearful. If you only treat one cat with medication and behavior therapy, then you are only fixing half of the problem. 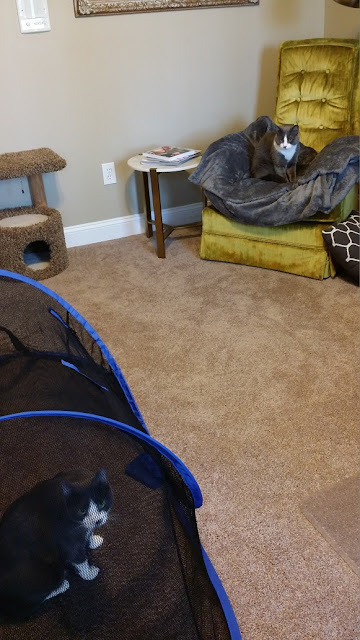 We've graduated from cracking a bedroom door and allowing them to see/smell each other, all the while giving treats and calm praise, to interactions through a baby gate, to putting one of them in this kitty pop-up-tent so they can get comfortable with the other being in the room. I am doing this 2-3 times a day. It's been a major kitteh herding effort and one of them has to be closed off in one room before I let the other out to have "yard time". Miss Thang is still secluded in her "fortress of solitude" most of the time, but these interactions are very promising. 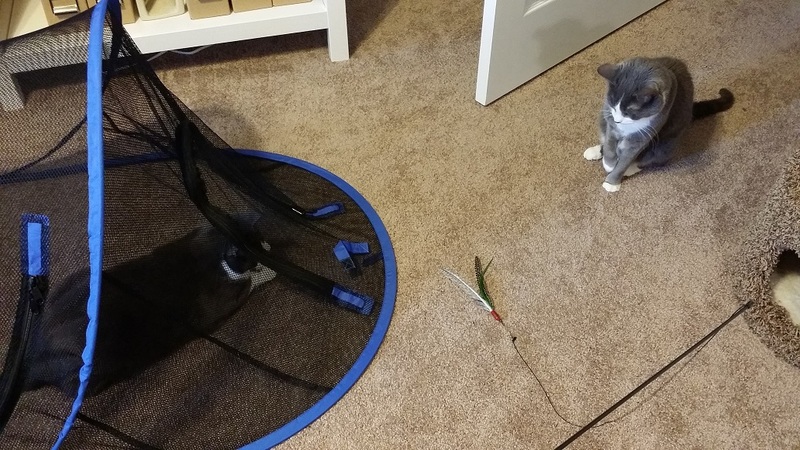 No hissing, growling, or lunging, but pupils are dilated and they intently watch each other. When doing reintroduction therapy for redirected aggression, it's very, very important to monitor the cat's body language. You can never simply separate your cats for an extended period of time and then open the door and expect them to be buddies again. In their minds, they are still reliving that bad experience or episode and need to have hands-on monitoring during these re-introduction sessions. You should never, ever let your cats "work it out" after a redirected aggression episode either, as they will only learn to be fearful or aggressive with each other. Each negative interaction will only reemphasize the fear and aggression, which will inevitably lead to other non-desired behaviors like improper elimination, high-levels of stress, and associated illness. You want every episode to end on a good note, so if you are reading that one cat is getting agitated, it's time to end the session. What you are doing is desensitizing them to being around each other, and you want them to associate good things with each other. Over time, these re-introduction sessions will be longer and more personal. How do you know when they can be trusted together? Well, the most stressed-out or agitated cat will be the guide for that. If one cat is calm and playful, but the other cat is obviously tense or scared, you must move at the tense/scared cat's pace! When he/she is calm or playful too, then you are ready for the next step. Do not try to rush it! If an encounter backfires by trying to rush re-introduction, then you could very well be back to square one. How long will this whole thing take is anyone's guess. I think it really depends on the strength of the bond between two cats before the aggressive episode. Some cat's re-bond after only a few days, some cats take weeks or months. Some cats will end up hating each other for the rest of their lives and a more serious decision will have to be made. Chaz and Miss Thang had a pretty strong bond beforehand, and I'm sure that has helped immensely. Next week will be one month since this whole mess started. In the meantime, here's Leo up for adoption. I don't know if he's been adopted yet, as they won't tell me, but I am trying to find out. I have a feeling that he was and I hope that he is happy and being loved by his new family.